This retrospective remembers the third voyage of space shuttle Columbia. The March 1982 mission served as another developmental test flight for the reusable spacecraft, testing its systems while also conducted a limited science agenda. STS-3 is distinguished by making the first landing at White Sands, New Mexico. This sweeping view from Cassini gives a sense of the awesome scale of the planet's disk-like ring system, which stretches many thousands of kilometers into the distance. The shepherd moon Prometheus (102 kilometers, or 63 miles across) maintains a lonely sojourn with the thin, outer F ring. 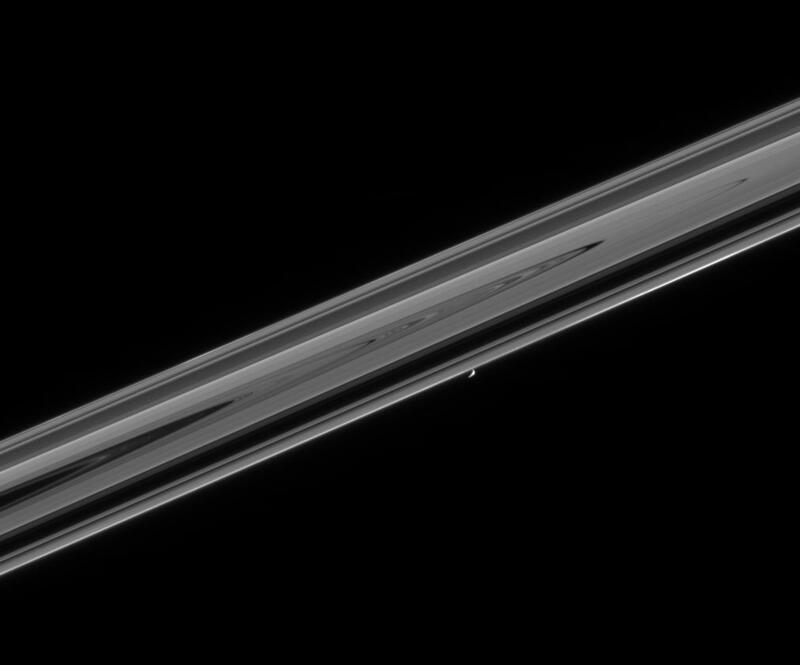 A notable brightening of the F ring material is visible ahead of Prometheus in its orbit, near the right side of this image. The view was obtained in visible light with the Cassini spacecraft narrow-angle camera on Feb. 18, 2005, at a distance of approximately 1 million kilometers (621,000 miles) from Prometheus and at a Sun-Prometheus-spacecraft, or phase, angle of 105 degrees. The image scale is 6 kilometers (4 miles) per pixel.